Fawzi is a visionary, thought leader, author, entrepreneur and contributor in advancing adoption of technology in serving humanity. 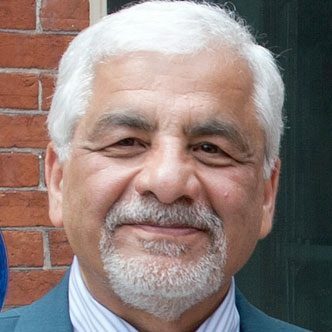 Fawzi spent over 30 years in industry and held various executive and leadership positions with Tier 1 companies in the areas of communications and networks spanning Service provider with Teleglobe Canada, Communications networking equipment with Nortel Networks and semiconductor with Motorola/Freescale in Canada and US. Fawzi was a principle architect and championed the definition and the developing of integrated pre-IoT telecom alert system and networking management solution at Teleglobe Canada. He was a senior product manager for broadband edge and core nodes with Nortel Networks. Fawzi also served as the Director of Strategic Marketing with Motorola/Freescale for SoC networking & Communications product line. Fawzi is passionate about technology automation and has founded TelNet Management Consulting Inc. in 2009 offering consulting services in the areas of IOT/mobile/wearable/GGIS technology trends and positioning for smart networking solutions in key market segments such as smart homes & buildings, health & wellness, smart energy & infrastructure and smart communities & Cities. Fawzi organized and chaired workshops, tutorials and was a keynote speaker and distinguished speaker at key events such as CABA, BHI, Himms/IHP, Circuit senior design day, N3XT in NA and abroad. Key topics included Smart Tech and others on key topics such as IoT, 5G, wearables, cybersecurity, virtualization and big data/analytics. President, TelNet Management Consulting Inc.
Several technologies are converging empowering IoT and delivering a greater impact and advance services to multiple markets by 2020’s. This presentation will introduce the concept of IoT and architectural evolution from a pre-IoT to Collaborative IoT impacting many markets such as home, health, automotive, enterprise, transportation and infrastructure. This will be enriched by several examples. The talk will then focus on healthcare and wellness exploring current and emerging solutions at hospitals, clinics, care centers and homes. Solution building blocks include sensing, aggregation, and data analytics. Examples of some of the adjacent technologies such as 3D, Robot, Drone and Wearables will be highlighted. Finally the talk will conclude with some of the factors and challenges to deliver scalable solutions, delivering better quality of services and experience. These include development platforms, 5G, virtualization, collaborative applications and security. 5G is not only classified as a higher bandwidth radio access technology, but also be the network for low-power devices and sensors that are classified as IoT devices, as well as low latency applications. Thus, 5G wireless network virtualization is envisioned to support billions of devices for wireless subscriptions and incorporate new wireless services for IoT. The presentation will provide technological progress, status and examples on IoT, 5G and how Virtualization will play an important part in accelerating services roll-out. Smart IoT solutions and services such as for smart connected homes and buildings have been unleashed due to the recent advancement in wireless, miniaturization technology, improvement in processing power, standards and market readiness. This presentation will examine the early adoption of IoT and draw a parallel as to how IoT has advanced empowered by technology and standards for sensing, gateway and services connecting 50 Billion smart things by 2020, to improve business efficiency and quality of life. Attendees will also learn about critical considerations in building IoT product and system solutions leveraging smart software IoT platform approach to handle security, event-filtering, messaging protocols, cloud server, and sensor fusion framework. IoT roadmap calls for collaborative intelligent approach that will impact our connected life and businesses. IoT application requirements for some of the future opportunities for smart homes & buildings will be explored supported by some use-cases. This session will address the vulnerability of IP security systems and of the Internet of Things (IoT). The session will explore techniques to identify areas of risk and techniques to secure IP networks and provide examples such as keeping smart homes safe from hackers and provide insight on how to protect homes and people from the many threats. Smart home technology is here and becoming more sophisticated every day. Before consumers start integrating smart devices into their homes en masse, they’ll need to feel confident that such technology is secure. Learn why it has been recommended that consumers should look for devices that feature 128-bit encryption or higher. Consumers should also be able to have encryption on all their devices, including communication between devices. Though any WiFi, Bluetooth or other enabled device could have security vulnerabilities, learn why security monitors need special attention…especially home monitors and baby monitors. Attendees will also learn about the latest efforts in cloud and biotechnology that will help enable the internet of Things. What are some of the key drivers influencing the advancement of Collaborative IoT? What are some of the key examples and benefits? Is it too early to talk about IoT KPI (Key Performance Indicators)? While IoT is still largely unknown amongst the general public, it is expected to make a big impact in 2015 and beyond. Estimates indicate that the number of connected devices will reach 4.9 billion this year, and various sources point out to 50-200 billion devices connected by 2020. This presentation will provide a quick overview on the evolution of IoT, explore future opportunities that calls for innovative approach supported by industry initiatives and standards activities. The presentation will explore the need for platform to launch and accelerate collaborative IoT applications, and present a few examples addressing smart health & fitness, smart home, smart energy, smart car, smart parking, smart public safety and smart cities.